The gameplay is designed to be realistic, and to this end EA has hired several consultants from the United States military. Typical in-game objectives are expected to be similar to those issued in real life such as raiding terrorist hideouts, hostage rescues and undercover operations.The game is loosely based on parts of Operation Anaconda; specifically, the events surrounding the Battle of Roberts Ridge. The single player campaign takes place in 2002 ,Afghanistan. For half of the game, players assume the role of a DEVGRU operator codenamed "Rabbit", of AFO Neptune. For the remainder, the player alternates between the roles of a Delta Force sniper code-named "Deuce", of AFO Wolfpack, as well as Army Ranger Specialist Dante Adams of the 75th Ranger Regiment, and AH-64 Apache gunner Captain Brad "Hawk" Hawkins. 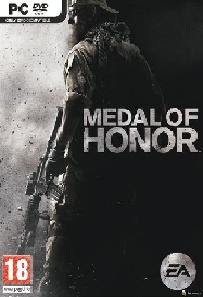 Medal of Honor's multiplayer was developed by EA Digital Illusions CE. Multiplayer is class based, with three classes available - Rifleman, Special Ops, and Sniper. The player earns experience during gameplay to level up and unlock additional weapons and weapon accessories. For example, at the start of the game the sniper class does not have a proper sniper scope available, and the player must reach level 3 to unlock a combat scope. If a player earns a certain amount of points before dying, called a score chain, he or she earns a choice of an offensive support action such as a mortar strike or missile attack or a defensive support action such as intel or ammo. The player is not limited to one support action per life and can earn them continuously. Gameplay features two opposing sides, the Coalition, usually referred by the in-game battle chatter to as "Python 1", against the Opposing Forces . The Coalition troops use American equipment such as the M16A4, AT4 and M9 pistol, while the Opposing Forces represent forces similar to the Taliban and use according equipment such as the AK-47, RPG-7 and Tariq pistol. Each weapon is designed to have a counterpart on both teams, although that counterpart may or may not have the same stats. Initially, the weapons are team-specific. However, as the player progresses, they will unlock weapons that are available for both sides, as well as unlocking the ability to use enemy weapons. Once reaching level 8 in any one class the player is considered Tier 1 and assumes a different appearance, and when killed the tier 1 player's killer receives 5 extra points for killing a tier 1 player. On November 2, 2010, DICE released two DLCs for multiplayerΓΓé¼ΓÇ¥a game type called "Hot Zone", which is a king-of-the-hill style mode and another game type called "Clean Sweep", a last-man-standing game type.